Asus were among the first to use the hybrid design that has become so popular lately - a laptop with a detachable screen that turns into a tablet. However, that leaves the QWERTY keyboard to just do nothing more than pack a battery and a few ports and slots. Not so with the Transformer Book Trio - the keyboard dock, called "PC Station," packs a 4th get Intel Core i5 or i7 processor (Haswell), up to 1TB HDD, a 33Whr battery and runs Windows 8. Using microHDMI or mini DisplayPort you can hook it up to an external monitor and use it while someone else is using the tablet. The tablet has an 11.6" IPS LCD touchscreen with 1080p resolution and it's powered by an Intel Atom Z2760 (Clover Trail) chipset with the dual-core processor at 1.6GHz and runs Android 4.2 when it's separated from the PC Station. It has its own 19.5Whr battery and storage is up to 64GB. 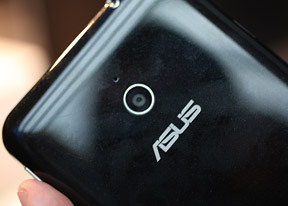 The tablet also has two cameras - one 5MP on the back and one 1.2MP on the front. If you have the two halves put together, you can choose between Windows 8 and Android 4.2. The whole thing is surprisingly light for something this size, especially since it's two separate devices in one. The build quality feels decent though we have to say we liked the Transformer Pad TF701T better. As for the separate parts, the screen on the tablet is good without being spectacular (again the Transformer Pad has it beaten). At least the keyboard is pretty comfortable.